One of the most important things money can buy is safety. Or $250,000 for an identical home in a more dangerous area? Even though it might mean stretching your finances and borrowing a ton of money, most American families would choose to live in a safer area. The financial sacrifice is worth it because feeling unsafe is miserable. It ruins your ability to concentrate. It preoccupies you and stresses you out. It’s hard to be an effective person when you’re worried your kids aren’t safe. So we buy cars that win safety awards. We install expensive security systems. We pay the military billions to safeguard the country. The thought of losing 20% of your nest egg in the market can be scary. For many folks it’s just as gut-wrenching as the thought of a stranger breaking into your house at night. 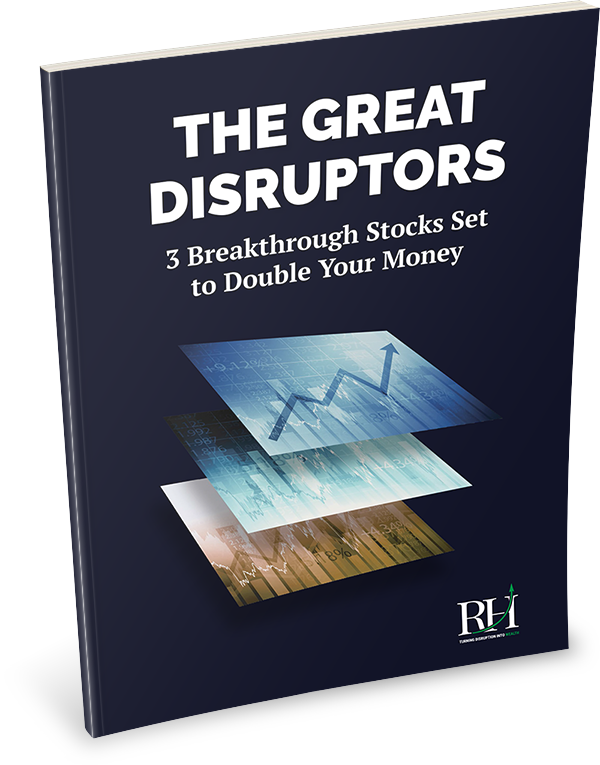 You probably know that fast-growing stocks in exciting industries often command high prices. But boring, slow-growing stocks are often expensive, too—if they’re perceived as safe. Take Procter & Gamble (PG). It’s a 200-year-old company that’s grown into the 15th largest publicly traded company on earth by selling basic essentials. Its brands include Gillette razors… Tide laundry detergent… Crest toothpaste… Dawn dish soap, and Bounty paper towels. No matter what happens in the markets, we’ll always brush our teeth, wash our clothes, and clean the dishes. Selling necessities is a rock-solid business. From 1982­–­2012, Procter & Gamble grew its sales 28 out of 30 years. This consistency is why P&G has long been considered one of the safest stocks on earth. 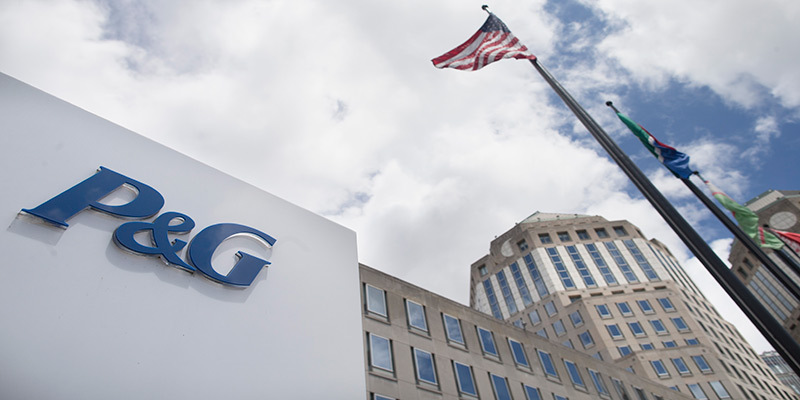 P&G trades for roughly 25X its profits. That’s very expensive for a business that’s seen profits drop 20% over the past decade. For reference, the average S&P 500 company trades for 21X profits. As you surely know, online giant Amazon has put dozens of companies out of business in the last few years. Through selling stuff online for low prices, it has disrupted iconic brands like Toys R Us, Sears, Circuit City, and RadioShack into bankruptcy. In 2000, online sales totaled $27 billion. This year that figure will jump above $550 billion—good for a 20X leap in less than two decades. By claiming a big chunk of this growth, Amazon has propelled its stock over 100,000% since it IPO’ed in 1997. 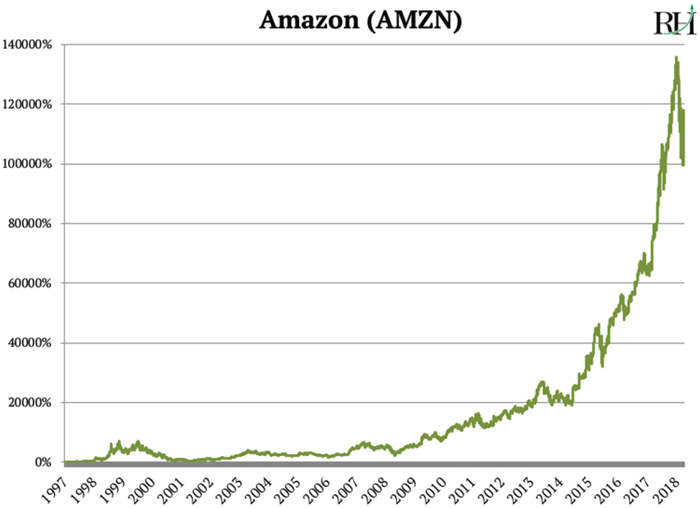 You can see Amazon’s incredible gains on this chart. Over the past three years, Amazon has launched more than 100 of what it calls “private label” brands. They are Amazon’s own products, sold under different names. Amazon now sells its own diapers… dish soap… laundry detergent… baby wipes… and around 5,000 more everyday items. There’s not a whole lot of difference between most “essential” items. Crest toothpaste is roughly the same as Aim, which is roughly the same as Colgate. And do you really care if the batteries in your TV remote are Duracell or Energizer… or a “private label” Amazon brand? The key is Americans are buying more and more essentials online. The fastest-growing category on Amazon is food staples—like breakfast cereals. Personal care products like soap and toothpaste are a close second. You simply ask Amazon to send you laundry detergent monthly… and a container of it will show up on your front porch at the same time every month. Instead of ones made by other companies like P&G. Make no mistake… Amazon is marching in on the territory of formerly safe stocks like Procter & Gamble. As the 15th largest publicly traded company on earth, it has the most to lose. But its “safe” peers face the same big problem. Have you tried Subscribe & Save from Amazon? Tell me at Stephen@RiskHedge.com. RiskHedge reader Ethan has a question about my 5G “landlord” essay. 1) There seems to be a lot of local opposition to small cell deployments. Do you think it will impact growth? 2) SBA Communications (SBAC) got out of the small cell business back in 2015. Do you know why they made the move? And do you think that reason would be a valid argument to NOT invest in CCI? Ethan, thanks for your questions. As I explained a few weeks back, the US government is determined to beat China in the race to develop 5G. Certain state and local governments have slowed down 5G deployment by tangling it up in red tape. But the FCC’s recent passage of its 5G “FAST” has cleared up most of this interference. SBA sold their small cell business because they weren’t making money on it. As I mentioned, it was taking some local governments 800 days just to process applications for small cell towers. But since the FAST plan took effect, small cell towers are going up 6x faster than before.